The Carr Hoop II Step is the epitome of hoop steps. In a rapidly growing industry it's rare to find something so timeless. The Hoop II steps are constructed of durable rust, and corrosion resistant aluminum alloy. This ensures that the finish will last as long as the warranty, a lifetime. The step is 10 inches wide, this is enough to provide the greatest functionality without compromising ground clearance unnecessarily. The width and flat diamond tread stepping area make this step highly slip resistant. We've all seen the statistics, slips and falls are dangerous. Luckily, this set of Hoop II steps is ready to perform in any environment. The Carr Hoop II Steps install easily and are shipped with all of the necessary hardware. Carr guarantees their steps with a limited lifetime warranty. Carr is offering a limited lifetime warranty on their Hoop II truck steps. 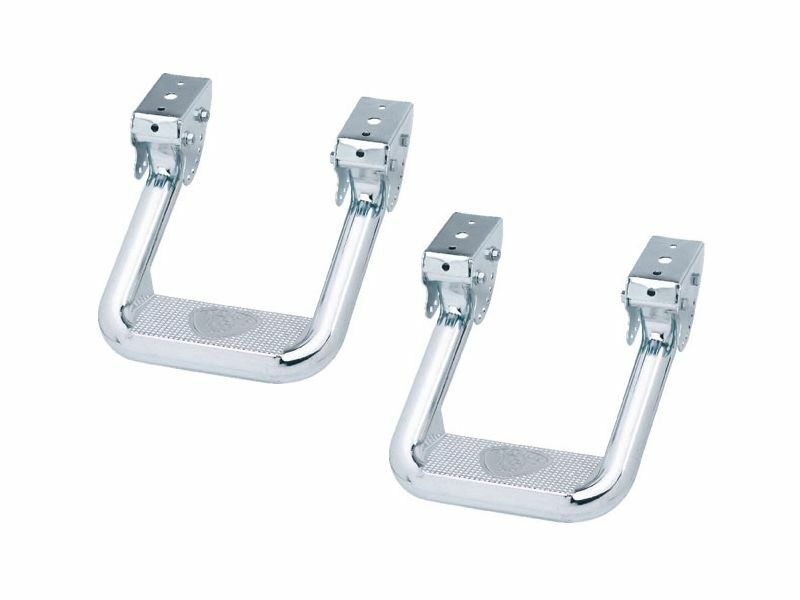 Carr polished aluminum Hoop II truck steps offer an easy installation. Drilling may be required on certain models. For additional information call us at 877-216-5446 or 701-253-5906.